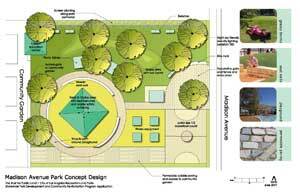 We're working to build a new park on Madison Avenue in East Hollywood. Funding secured through the California State Parks, Department of Parks and Recreation, Statewide Park Development and Community Revitalization Program will transform part of this half-acre lot into recreation play spaces. The Los Angeles Community Garden Council will use the remainder of the site to build a community garden. Once past the entry plaza's decorative gates, kids will discover the dynamic new playground and junior-sized basketball court. With a large sunshade covering the area, children can play year-round. Adults will be able to exercise with friends at the Fitness Zone® outdoor gyms located adjacent to the playground. People can relax on the mosaic-tiled seat walls circling the playgrounds, at the picnic tables, or on grassy mounds ringed by native, drought-resistant plants. The paths linking the playgrounds and fitness areas to the community garden and garden education center are made from cobbles that allow stormwater to permeate the ground. Project partners include: Councilmember Eric G. Garcetti, the East Hollywood Neighborhood Council, Los Angeles Neighborhood Land Trust, The City of Los Angeles, Department of Recreation and Parks. and the Los Angeles Community Garden Council.